Dubai: Dubai Police have been awarded the Asian Human Capital Award 2015 for their virtual training programmes in Singapore earlier this month, it was announced on Tuesday. Dubai Police was awarded after a team from the Award visited Dubai to review their application, which included four of their programs; The SWAT 2D/3D, The Virtual Sniper, Passenger Screening, and Motion Capture. Colonel Khalid Al Razooqi, Director of the Dubai Police Smart Services Department, said that Dubai Police’s application was among 43 others from all of Asia. “We are the first organisation in West Asia to win this award,” he said. The simulations are all programmed by Dubai Police’s Virtual Technology Centre at the General Department of Smart Services, and the first of these were introduced in 2009. Colonel Dr Ahmad Bin Juma Al Subaih, Deputy Director of Smart Services at Dubai Police, said the “programs help bridge the gap between the theoretical and the practical”. Other training programs include Crime Scene investigation (CSI), Traffic Accidents Investigation, Body Language, Traffic Fines and 3D Face Sketch. The simulation programs, many of which look like video games, mimic real-life situations and many are based on real criminal and traffic cases that were handled by police. “When the trainee goes through the simulation, it is like he is doing a real investigation, and he gets scored on each action he takes,” he said. Virtual training also saves money, time and effort and it provides the trainees with all the possible scenarios that they might face on the field,” Col Al Subaih said. Since 2009, 2,859 people from Dubai Police have been trained in 104 training courses on the various simulation programs. In 2015, 449 Dubai Police officers benefited from the programs. “We have provided this training for other entities, such as the Ministry of Interior, Sharjah Police, Qatar and International Civil Aviation Organisation (ICAO),” he said. Since 2011, 440 people from different entities were trained on the Dubai Police’s simulations. The department also has awareness games, such as Bayader Racing, Camel Racing, car racing and the knowledge city, which communicate awareness messages and concepts. The CSI simulation has eight different case scenarios and the Traffic Accident simulation has seven scenarios. The Dubai Police’s Virtual Technology Centre has the capacity to train 75 people simultaneously. SWAT 2D is a tool that helps the SWAT team train on planning for different operations such as hostage rescue. SWAT 3D is a multiplayer virtual environment in which the SWAT team is split into smaller units to bring a situation to order. The Virtual Sniper is a training program to hone their sniper skills. 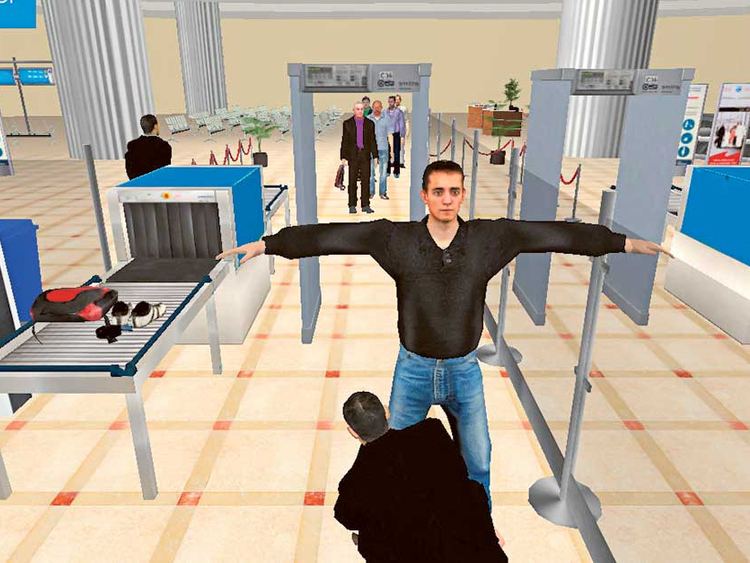 Passenger screening trains specialists at airports on the correct way to screen passengers in a virtual environment that mimics reality. Crime Scene investigation provides a virtual training program that simulates a crime scene and give the trainee the freedom to live the investigation by playing the role of the investigating officer.